Nearshore areas off of west-central Maui, Hawai‘i, once dominated by abundant coral coverage, now are characterized by an increased abundance of turf algae and macroalgae. In an effort to improve the health and resilience of the coral reef system, the Kahekili Herbivore Fisheries Management Area was established by the State of Hawai‘i, and the U.S. Coral Reef Task Force selected the Kā‘anapali region as a priority study area. To support these efforts, the U.S. Geological survey mapped nearly 5 km2 of sea floor from the shoreline to water depths of about 30 m. Unconsolidated sediment (predominantly sand) constitutes 65 percent of the sea floor in the mapped area. Reef and other hardbottom potentially available for coral recruitments constitutes 35 percent of the mapped area. Of this potentially available hardbottom, only 51 percent is covered with a minimum of 10 percent coral, and most is found between 5 and 10 m water depth. 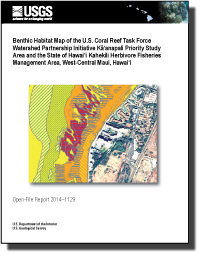 Cochran, S.A., Gibbs, A.E., and White D.J., 2014, Benthic habitat map of the U.S. Coral Reef Task Force Watershed Partnership Initiative Kā‘anapali priority study area and the State of Hawai‘i Kahekili Herbivore Fisheries Management Area, west-central Maui, Hawai‘i: U.S. Geological Survey Open-File Report 2014-1129, 42 p., https://doi.org/10.3133/ofr20141129.